A rail bridge overpass (shown) in Landis/China Grove, North Carolina, was completed in 2017 to eliminate a crossing. Although fatalities resulting from train-vehicle collisions at grade crossings are much lower than they were decades ago, a leveling off of those statistics in recent years has federal, state and railroad industry officials calling for new strategies to further drive down the number of crossing incidents. U.S. Transportation Secretary Elaine Chao and Federal Railroad Administrator Ronald Batory were among those sounding the crossing safety alarm in late October 2018 at the Federal Railroad Administration's (FRA) Grade Crossing Safety Summit in Washington, D.C. Organized by Batory and attended by government and industry stakeholders, the summit covered the need for additional infrastructure improvements and public awareness campaigns at federal and state levels to further improve crossing safety. According to FRA data, the number of highway-rail fatalities have ticked up over the past three years, from 237 (out of 2,079 incidents) in 2015 to 255 (out of 2,049 incidents) in 2016 to 270 (out of 2,120 incidents) in 2017. Rail safety experts cite two factors that they believe are behind the trend: a higher volume of train traffic and a greater number of distracted drivers and pedestrians. In response, Chao announced to the summit’s attendees that she has asked federal agencies — the FRA, Federal Highway Administration, Federal Transit Administration, Federal Motor Carrier Safety Administration and the National Highway Traffic Safety Administration — to work together on advancing crossing safety. Chao expressed a specific interest in using new technology to reduce crossing incidents. Along those lines, the FRA in 2017 launched one solution: the GX Dash!, a tracking tool that provides an analysis of crossing collisions, deaths and injuries over the past decade. Aggregated information can be used to determine trends, as well as break down data by state and county, type of vehicle, vehicle position, time of day, and the presence or absence of warning devices. Additionally, the FRA is working with the U.S. Department of Transportation's Intelligent Transportation Systems Joint Program Office, other modes and the private sector to keep crossing safety a part of the development of autonomous vehicles, she said. The FRA has committed $1.9 million to that effort to date, with another $514,000 allocated for fiscal-year 2019. All those efforts are on top of ongoing crossing projects — improvements, grade separations and closures — being pursued by state departments of transportation in coordination with freight and passenger railroads to bolster safety. For example, In northeastern Illinois, grade separation projects are on the 2019 agenda for the Chicago Region Environmental and Transportation Efficiency (CREATE) program, a long-term public-private partnership among more than a dozen railroads and government agencies working together to address train congestion in the nation’s busiest rail hub. Seven CREATE crossing projects will be in the environmental phase and two will be in the design phase this year. Those in the environmental phase would eliminate crossings on Belt Railway Co. of Chicago (BRC) tracks by creating overpasses or underpasses for vehicles using 63rd Street, Central Avenue, Archer Avenue and Columbus Avenue. In addition, a project calls for eliminating the crossing at 95th Street — used by Union Pacific Railroad and Amtrak trains — by developing an overpass or underpass. 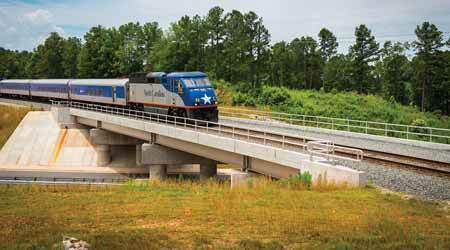 The Morrisville Parkway bridge (shown) is among grade separation and crossing elimination projects recently completed in North Carolina. Projects in the design phase involve a crossing of Norfolk Southern Railway at Morgan Street in Chicago, where freight-rail traffic results in motorists backed up on Morgan and extending onto Pershing Road. The project calls for alternative roadway signal improvements at the crossing, providing warnings and signage that would direct motorists to alternate routes that are blocked. Part of the larger 75th Street corridor improvement project, the second crossing project in the design phase calls for a grade separation of 71st Street and a CSX line. Meanwhile, the North Carolina Department of Transportation's (NCDOT) Rail Division is managing 18 grade separation projects and 23 crossing closures, as well as six active crossing closure and/or grade separation studies. Over the past year, the division has completed 28 crossing warning device improvement projects. Forty others are in the engineering stage or nearing the start of construction, according to Jason Orthner, the division's director. The 18 grade separations are primarily between Charlotte and Raleigh, which are the state's population centers. 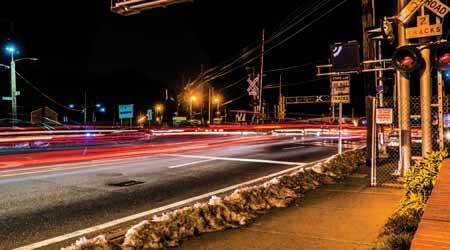 One of the larger and more complex crossing projects is in the town of Cary, where NCDOT has proposed a grade separation of the northeast Maynard Road crossing near its intersection with East Chatham Street. The State Transportation Improvements Program identified the project as necessary to eliminate rail-highway conflicts, and to improve traffic flow and safety. According to the town's website, the project is estimated to cost $38 million and is slated for construction in 2024. NCDOT officials held a public hearing on the project’s proposed designs and improvements in October 2018. 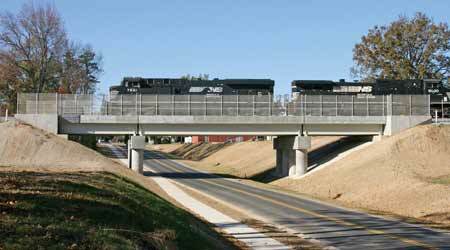 The project is among the more complex grade separations because it involves a five-lane crossing over two Class I lines — NS and CSX — in a corridor owned by a third railroad, the North Carolina Railroad Co. (NCRR), Orthner says. The proposed work involves an overpass or underpass. The various options and potential impacts on the environment — as well as on traffic during the construction process — still were being evaluated as of late December. Another of NCDOT's major grade separations — the Sugar Creek Road crossing in Charlotte — is underway and expected to wrap up this year. That project calls for building a bridge on Sugar Creek Road, realigning North Davidson Street, extending Bearwood Avenue, building a new connector road, removing an existing intersection and permanently closing the Craighead Road crossing. The $43 million project is being funded by the city of Charlotte, NCRR, NS, the FRA and NCDOT. The section of railroad is part of the federally designated Southeast High-Speed Rail Corridor. To improve safety at existing crossings, NCDOT — like many railroads — has sought more reliable forms of technology, Orthner says. For example, in 2014 the department began a pilot project to deploy radar-based vehicle detection at four-quadrant gate systems. "It allows a vehicle — that would otherwise be trapped by a four-quadrant gate system — a route out of the crossing," Orthner explains. "The radar system senses the presence of a vehicle and will raise the exit gate to allow the vehicle to exit the crossing." The technology has been installed and tested at seven locations as part of the pilot project, which was funded in part by a grant from the Federal Highway Administration. NCDOT is awaiting the FRA’s approval for the detection systems' implementation. "We think — and I'm optimistic — that next year we would see those systems go live," Orthner says. Meanwhile, the Indiana Department of Transportation (INDOT), municipal and rail industry representatives are enthusiastic about a new, one-time pot of state funding aimed at helping complete millions of dollars’ worth of crossing projects statewide. Last month, INDOT awarded $121 million in matching funds for crossing projects through the department's Local Trax Rail Overpass Program. Launched in 2018, Local Trax provides funds for Indiana cities, towns and counties to competitively pursue high-priority grade separations, crossing closures and other safety enhancements at railroad intersections with local roads. The program, which Indiana lawmakers approved as part of a long-term road funding package, requires local governments to provide 20 percent of funding for land acquisition and construction; the state will provide the other 80 percent. INDOT will fund and manage design and environmental work, as well as provide project management. Beyond state and local government funding, NS, CSX and CN are contributing a combined $10 million toward the cost of projects involving their railroads, according to INDOT. After putting out a call for applications, department officials were surprised to receive 28 responses requesting a total of $360 million in Local Trax grants — far more than the $125 million available under the program, according to INDOT Manager of Railroad Services Jason Holder. "The response was overwhelming," says Holder. "The state did a great job putting together worthwhile projects, which made the second part difficult — deciding which projects to choose." The department ultimately chose to fund a dozen projects, all involving Class Is. With safety improvement being the No. 1 priority, INDOT looked for those that eliminated crossings. "From an accident perspective, Indiana historically is in the top three or five states in incidents in the nation," says Holder. "We have more crossings per track mile than any other state. That results in a unique situation affecting safety at crossings and how trains impact local communities." The 12 projects selected for Local Trax funding will enable INDOT to eliminate 33 crossings, according to Holder. "The projects will address a significant number of problem crossings, including the most dangerous in the state," he says. Several projects involve the construction of bridges over crossings in northwest Indiana. One complex case entails three railroads' lines — CN, CSX and NS — and calls for building a road that will connect with a nearby overpass to allow vehicles to bypass the crossing on North Clark Road near the airport in Gary. The $22 million project qualified for $15.2 million in Local Trax grant funds. While infrastructure improvements can go a long way toward diminishing the likelihood of crossing incidents, such projects aren’t enough. Year-round education and public awareness campaigns also are necessary, according to USDOT's Chao. "The data indicates that only 32 of the more than 2,100 crossing collisions [in 2017] involved failure of automatic warning devices," Chao told attendees at the FRA crossing summit. "That means every day, drivers, pedestrians and others are making dangerous, reckless decisions to try and 'beat' trains." Federal and state agencies along with railroads have been stepping up the messaging. At the USDOT, the National Highway Traffic Safety Administration will continue the "Stop. Trains Can't" public information campaign launched in 2018 and supported with a $4.3 million advertising buy. An additional $4.5 million has been obligated for an ad buy in fiscal-year 2019. At NCDOT, the rail division has a position dedicated to rail safety education and awareness. The person in the role is the "face" of the state’s rail safety efforts, according to Orthner. North Carolina also is among states that have Operation Lifesaver programs aimed at educating the public about the dangers of drivers trying to "beat the train" at crossings or pedestrians using railroad tracks as walking paths. At the national level, Operation Lifesaver Inc. (OLI) has been behind the annual Rail Safety Week campaign in September, which last year for the first time was held jointly with Operation Lifesaver Canada. Coordinating rail safety activities across two countries during the same week definitely helped raise awareness among the news media and the public, says OLI Executive Director Rachel Maleh. "In terms of sharing resources and visuals, we were able to do more and have a bigger impact," she says. Different events were held each day to highlight crossing safety and trespass prevention in high-incident areas. For example, OLI partnered with Amtrak to organize Operation Clear Track, in which 527 police departments and other agencies in 48 states worked to enforce grade-crossing and trespassing laws at nearly 1,200 high-incident crossings. On that day, law enforcement distributed 45,204 railroad safety cards, gave 4,313 verbal warnings to drivers, issued 2,501 citations and made 34 arrests. Although OLI officials were pleased with participation in the first U.S.-Canada Rail Safety Week, more must be done to reduce crossing and trespassing incidents, says Maleh. "We have made some inroads, but there is a lot of room for us to grow," says Maleh. "We believe there are a lot of opportunities to get the safety message out and we’re anxious to work with the FRA in doing so."